﻿ LaserStreet.com - Leica DISTO A3 - Price Match/Beat & Trade-In plus FREE Shipping! Trade & $AVE!!! 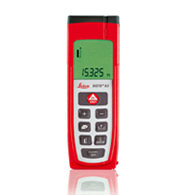 - Trade in your old Laser Meter for a new DISTO™ D3 Click here for DISTO Trade-In details! which is in stock and shipping now. The A3 is no longer available! The Leica DISTO™ A3 is the small, robust base model for modern measurements. The new DISTO™ A3 replaces the DISTO™ Lite, a favorite among measuring professionals. Minimal size and simple operation are the defining characteristics of the basic model. Shortcut keys for addition, subtraction, area and volume mean that measuring could not be simpler. Minimum and maximum functions have also now been incorporated. You could even say that this compact unit is fun to use. Reliable, simple and – from now on – always on hand when you need it. For measuring longer distances, indirect measuring (Pythagoras), wireless data transfer, or a Digital Zoom Viewfinder see the DISTO™ D5 and DISTO™ A6. For an integrated inclinometer, check out the DISTO™ D3 and DISTO™ A8. Accurate to ± 1/8th of an inch with a range of 325 feet!